I'm incredibly honored to announce that The Steep and Thorny Way was named a Kirkus Best Teen Book of 2016. Thank you so much to Kirkus for this much-appreciated recognition for the novel! 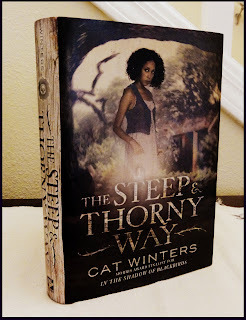 The Steep and Thorny Way was also honored in the Chicago Public Library's Best Teen Fiction of 2016, Barnes & Noble Teen Bloggers' Favorite Books of 2016, and Capitol Choices 2016 nominees. I couldn't be prouder. Now that I've wrapped up all of my 2016 celebrations for the release of both The Steep and Thorny Way and Yesternight, I'll let you in on some behind-the-scenes news for my next two novels. In case you haven't yet heard, I have a brand-new young adult novel in the works, Odd & True, and it's scheduled for publication in Fall 2017. I just wrapped up the line edits stage with my Amulet Books editor, Maggie Lehrman, and the novel is now in copyediting. I've seen an early sketch for the cover design, but I probably won't be able to reveal the cover or share the official synopsis until sometime in the first three to four months of 2017. However, because I know that's a long time to wait, I'll share two of my favorite lines from the first chapter right now . . . Odd & True is an extremely personal novel for me, and yet it's also my most fantastical tale. I love it dearly and can't wait to share more about it in the new year. Yes, I also have a 2019 novel in the works! It's the second novel of my two-book YA deal for Odd & True, but it won't be a sequel. My editor recently approved my plans for another standalone historical novel, and I'm currently immersed in the research stage. I won't yet reveal the subject matter, but I will say it involves a real-life figure from the past. Once you hear who that person is, I think you'll agree it sounds like someone I'd write about. I do have a yearning to write an Odd & True sequel, but I'm waiting for the ideas to further develop, plus I want to see how the first book does next year. 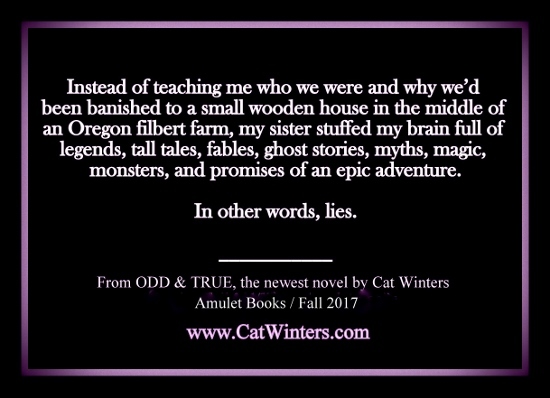 I'll spread the word when options for preordering Odd & True become available. Thank you so much, Carina! Happy holidays!